I believe in Christian based homeschooling. One of the reasons why my husband and I teach our children is so that we can pass on our faith. We want our children to develop a biblical worldview. Below are suggestions for curriculum. Some are large companies and sell also to private schools. Other curriculum writers are homeschool families. Their materials are specifically for parents who teach their children at home. Education is more than curriculum. Below are ways that you can include holidays and the Bible in providing a faith-based schooling. It is important to find Christian based homeschooling curriculum that supports your views. Before you buy ask friends at your church what they use to teach their children. Also try to preview material before you buy it. See if the company has a website where you can view sample pages of their materials. Christian Curriculum – Today there are large and small companies that produce materials for homeschoolers. Here is a list of the companies that I have used or had friends that used the curriculum. Alpha Omega – I have used products from Alpha Omega. Here is a review of what I have used. Sonlight – I have had friends that have used Sonlight and have been happy with the results. Bob Jones Homeschool – Bob Jones is a textbook company that started marketing to homeschoolers in the 1980’s. Read more about what this company offers. Heart of Wisdom Homeschool – I have looked over the Heart of Wisdom site and liked a lot of what I saw. Read more about this approach. A Beka Homeschool Curriculum – This company uses a traditional approach. Read about their textbooks and other materials that they offer. Most of the above companies sell complete curriculum packages for each grade. You can also buy one textbook for a subject. There are also some Christian based homeschooling companies that specialize in science or history. Apologia sells science books. I have used their books for high school. Now they sell books for elementary students. I have used America the Beautiful by Notgrass. Another history curriculum that I have used is History Reveled. 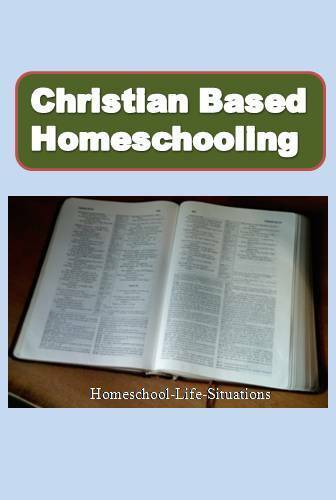 There are also some free Christian based homeschooling materials on the internet. I have received offers through e-mails that I have signed up for and through kindles free e-book program. Free Christian materials – You can find free materials on the internet. Read about some of the sites that I have used. Ambleside is a free curriculum guide for parents that use the Charlotte Mason method. Other parents would be interested in the classical book lists. There are different teaching approaches. You can find unit studies, textbooks, and companies that use the classical approach. Classical Christian Approach – Many Christian like the classical approach. Here is a list of venders that sell materials to homeschoolers. Even though there is not a perfect curriculum, find one that works for your family. First think about how you want to teach your children. Then read some reviews on the curriculum that you are thinking about buying. Christian Homeschool Curriculum Reviews – What you need to consider before reading reviews so that you can find the best curriculum for your family. Christian homeschooling Books – Here is a list of books for science, history, and language arts. Church is a place of support. It is good to have friends. At church children are involved with Sunday school and other Christian groups. My children learned to serve by helping with different church activities. Some churches also have Christian based Homeschooling support groups. When my oldest children were young we went to a church support group. Our group went on field trips together and had a Keeper at Home group. Besides going to church and using Christian curriculum read the Bible together as a family. When my children were young we read from a Children’s Bible. Read a devotionals book together. Or go to a family Bible study. Your child can keep a notebook of the stories that you have read. On the notebook page a young child can draw a picture of what the story means. An older child can write out the passage and what it means to them. Favorite Bible Stories - This is a list of our family favorites. Bible Study – Read about how to have a bible study and some of the themes to include. Bible as Curriculum – Here are ideas for using the Bible to teach history and language arts. Christian based homeschooling is more than reading the Bible. Teach what you believe. Teach about why you go to church and read the Bible. Teach why you celebrate different holidays. Holidays are a great time to teach what you believe. Read about how I used art, history, and decorations to teach. Christmas - Here are ideas celebrating in the month of December. Music can also play a part in Christian based homeschooling. When my children were younger we sang along with We Sing Bible Songs. Today we listen to the radio and CDs. We also read biographies of moral men and women. The fiction books that we read promote Christian values. We should also live our lives before our children. Deuteronomy 6:7 says, “You shall teach them diligently to your children, and shall talk of them when you walk by the way, when you lie down, and when you rise up.” This verse says to me that we should teach our children our beliefs while we live our day. Biblical Reasons to Homeschool – Here are Bible verses that have encouraged me in teaching my children. We can also find ways to serve God together. If you look there are opportunities. We can help with different ministries in the church. We can help in our communities. Or we can go on a short-term mission trip. Christian based homeschooling is more than the curriculum that we buy. We can pass on our faith by how we live.